Alan Gross, who was released after five years in a Cuban jail, says "it's good to be home" upon arriving in Washington. 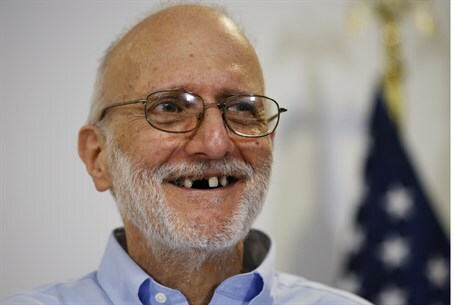 Alan Gross, the Jewish American contractor who was released on Wednesday after five years in jail in Cuba, sees his release as a Hanukkah gift. “It’s good to be home,” he added. His release for three Cubans held in the United States for spying set the stage for a thaw in ties between Washington and Havana, which have not had diplomatic relations in more than 50 years. Gross landed at Andrews Air Force Base outside Washington, shortly before President Barack Obama announced the biggest change in relations with the island nation in half a century. In his remarks, Gross thanked Jewish organizations and U.S. lawmakers for pressing for his release. “It was crucial to my survival knowing that I was not forgotten,” he said, according to Bloomberg. Gross was joined on the flight home by Democratic Senator Patrick Leahy of Vermont and Democratic Representative Chris Van Hollen of Maryland. U.S. Senator Tim Kaine, a Virginia Democrat who’s on the Foreign Relations Committee, hailed Gross’s release and thanked Pope Francis and the Canadian government for their efforts as intermediaries.